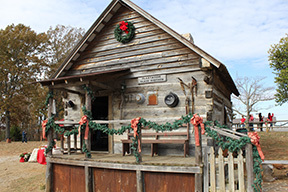 Built in the memory of the mountain Side village that once looked over Leighton Alabama, LaGrange Historic Park was built in the spirit of remembrance, with the goal of introducing the antiquities of the past into the present. 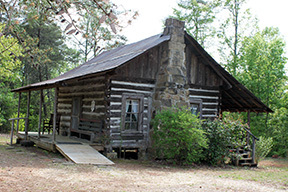 Dotted across the clearing are handmade log cabins, each filled with history of their own. Walk in and amidst these carefully crafted structures and see if you don't find yourself taking a walk into Southern history. View the video of Roy May at 102 yrs of age discussing the building of the observatory during the early 60's at Lagrange College Site during Christmas in the Country 11-18-2017. YouTube video link. 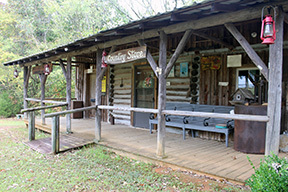 One of the first sites you see as you come up the LaGrange Mountain is the operational post office and gift store. Built with recreation in mind, you'll find oil lanterns hanging on the porch posts, and tool carved signs hanging over each door. Inside the gift store is an eclectic collection of antiquities that you can bring home with you. Next door is an operating post office decorated with burlap postage bags, antique signs, and leather bound logs. As you first summit the final hill to the LaGrange Park, you'll drive upon the Main Home and Museum. Built in the Antebellum style, this house portryas the typical southern home of the LaGrange Village now lost to time. A wide front porch with an hand woven wicker swing welcomes guests and family alike to sip sweet tea and enjoy the mountain scenery. Inside are a cozy foyer and two main rooms open to the public that house an array of artifacts. Here you can see anything from a civil war officer uniform to a Bible that used to reside on the fireplace mantle of the LaGrange college main hall. This Guest home sits in the shade of an oak tree near the treeline of the current LaGrange village. Every effort was made to preserve the historical integrity of this recreation, while still discreetly integrating modern amenities. Outside, you'll see the visage of a cozy cottage, hand fitted log structure, rocking chairs on the front porch, and smoke billowing out of the chimney. Step inside and you'll discover you've stepped back in time. Hand made furniture around a stone hearth is downstairs, while upstairs you'll find a a cozy place to sleep, with quilted bedding. Just behind the main house is the servant quarters and kitchen. This cabin is filled with ceramic ware, handmade furniture, and an open fireplace for cooking and heating. 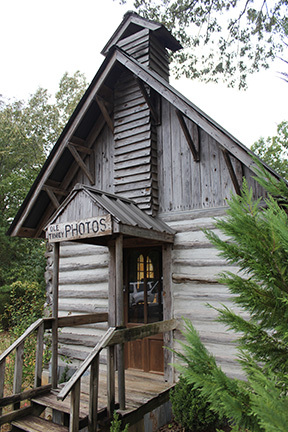 Take a look inside to see the history of these humble homes. A chapel rests near the northern side of Village. Inside you'll find a perfect hall for small ceremonies or photos. Outside is a picnic area and the pavilion. To the side of the main home is the farmhouse used for housing of livestock and storage for tools. Here you can see displayed on the walls many of the tools used by the early American farmhand, and gain perspective on the daily chores an antebellum worker may have.